The fifth installment in The Killing Game Series opens with Special Agent, Ives Andrich, searching for his missing wife in a remote town in southern Bavaria. Despite the FBI’s censure, Ives never gave up on finding her. To get her back he will walk head-on into what he presumes is a Nazi lair. Once there, things are not what they seem; they are eerily civilized. Confronted with an extraordinary proposal, Ives is forced to make a deal to rescue his wife, but is his only choice to aid her captors? 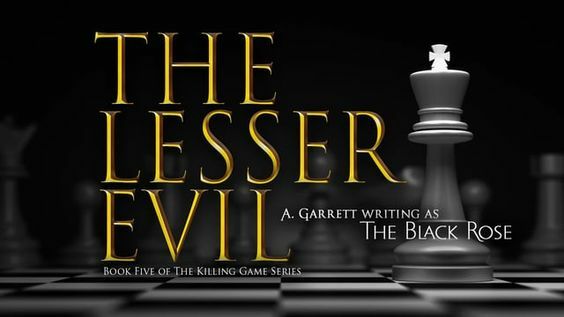 Or will he attempt to foil their master plan in The Lesser Evil, book five in The Killing Game Series, a Romantic Suspense Thriller Series by The Black Rose. The Black Rose is an author, photographer, and filmmaker. Born in Chicago, she currently resides in New York with the love her life, her Hokkaido Dog, Kuma. She began writing at the age of seven and dabbled until she woke up one day and simply had to write a novel. She has several 5-Star reviewed novels, both part of individual series. She categorizes her novels very directly; “My writing is deeply rooted interpersonal relationships: people’s feelings, thoughts, emotions, and the intimacies between two people that truly love each other despite the circumstances surrounding them.” Her genres are suspense, thrillers, crime, romance, and espionage. As she says, “I write about love, honor, and doing the right thing, even when it seems disadvantageous, even when it’s not the popular path to take.” She sees her writing as a gift from God, and appreciates and learns from her stories. Her writing passion stems from her immense love for art, which began with drawing at age five and moved into oil painting by age eight. Her love and study of photography soon became a professional passion, and she spends hours photographing and laying out her book covers. Readers can visit “Privé with The Black Rose” showcasing behind-the-scenes insights into her writing, novels, characters, photography, and films. She films and produces her book trailers and, in the future, plans to make short films.